Tis the season of the tarot! Lo and behold, the cards are having a renaissance, allowing artists near and far to interpret the ancient archetypes and symbols in their own way. And while there are plenty of decks on the market, we are especially fond of any that are femme and female centric. That’s why we are such a fan of the Celebrity Goddess Tarot Deck. Created by Faye Orlove, the cards find their footing in the glamorous and mystical women we know and love. 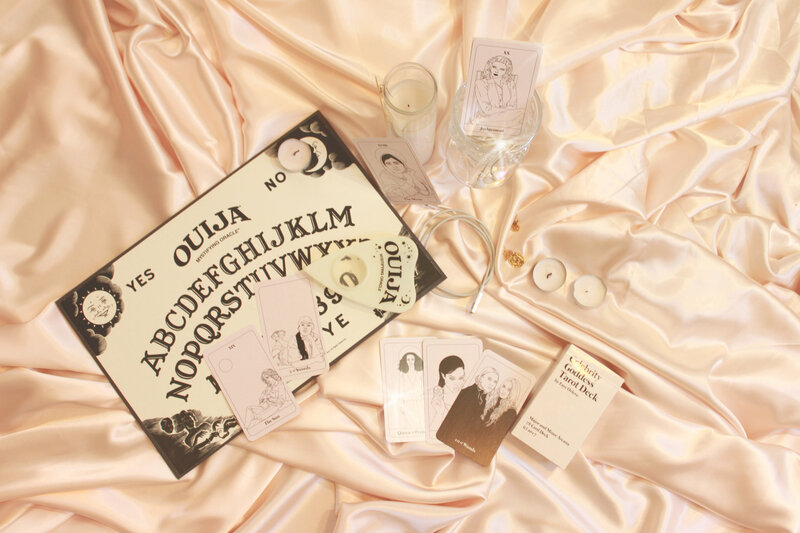 With everyone from Rihanna to Amy Winehouse to Dolly Parton immortalized in these cards, we’re sure that our intuition will be buzzing with feminine magick. If you want to take a leap into the tarot — but only if the arms of your favorite celebrities are there to catch you — then this is your deck. We sat down with Faye to talk about tarot, mysticism, and what she plans to do next. HelloGiggles: How did your journey with tarot begin? Faye Orlove: It began with personal readings friends would give me in their bedrooms! Sometimes, I’d cry. It always just started as a powerful way to think about my life and my choices. HG: How do you define the tarot? FO: As with everything sort of mystical, I use it as a way to relate to people, to think about myself, and to think about how I interact with the world. I would never firmly assert the mysticism, but I do believe in the power of being self-reflective and analytical. That’s such a Virgo response. HG: Why did you decide to use female celebrities as the archetypes on your deck? HG: What was the process of creating this deck like? FO: What was it like to create the minor arcana and court cards? It took a really long time! I really did try to match the celebrity with the card, to the point where you could make an assumption about what the card meant without knowing anything about tarot itself. I talked a lot to friends (especially tarot reader friends) about who they thought would be good fits, some were easy to draw and came really naturally, some felt more forced or had expressions that were tough to capture. Beyoncé was a tough one to draw. She has a really special energy and dominance I really wanted to capture. HG: Do you have a favorite card? FO: I really like Dolly Parton as the sun. FO: I like pulling a past, present, and future card and thinking about who I was, who I am, and who I want to be. HG: What’s your advice to someone who is looking start a journey with tarot, but is unsure where to begin? FO: Begin with someone who does know tarot! My friends introduced me to the world of tarot in a really safe and non-pretentious way. I’ve found that people who are great at reading the cards are nurturing and supportive, and I can’t imagine having a bad experience. HG: What can we expect next? FO: I’m hoping to make some videos of the celebrities in the deck getting their cards read with the deck. I think that would be amazing. You can purchase the Celebrity Goddess Tarot Deck here.